A sturdy black satin gothic burlesque corset with 9 bones in total and with black satin frills decorating the upper and lower hems. The seams are finished with black eyelet threaded with red satin ribbon. 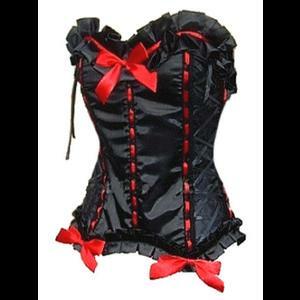 The corset has black ribbon laced panels on each of the sides. The front is decorated with a large red satin bow at the bustline and two further bows at the hem. The back has fully adjustable metal eyelet and cord lacing edged with black PVC and has a 4" wide modesty panel. Choker available separately in our jewellery section. Bust: 32" Waist: 28" Length: 13.5"
Bust: 34" Waist: 30" Length: 13.5"
Bust: 36" Waist: 32" Length: 14"